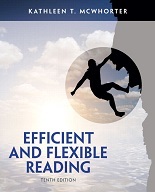 Efficient and Flexible Reading teaches students how to be self-aware, active readers and adapt key reading skills and strategies to whatever college text they encounter. Kathleen McWhorter’s renowned metacognitive approach teaches students to be aware of their learning processes by becoming active readers. Through clear instruction, examples and skill application regarding the key reading skills, Kathleen teaches students how to adapt their reading strategies to whatever texts they encounter through the active reading process. Furthermore, Efficient and Flexible Reading prepares students for their future coursework by focusing on college reading skills and strategies. Kathleen highlights the importance of reading critically and flexibly by asking students to think critically about the task at hand, the nature of the reading selection, and the skills most appropriate to complete the task.